I love this colour scheme because it’s not the traditional tones of pink, beige and gold, but those in between. What is more are the metallic shimmers and textures that make this style modern and elegant. On the rack, these dresses might not stand out against brighter and darker shades, however, match it with the right flowers, decor and cake and your wedding will be remembered like a celebrity’s. Above are some matte chiffon, Dessy dresses in colours oyster and blossom. Chiffon is perfect for the spring and summer period because it is light and delicate. If you choose to go for a strapless, a one-shoulder style, or any in this fabric, you are sure to look glamorous, gracious and gorgeously elegant. They also come in various corresponding colours like champagne, oyster and blush. If you are more daring and want to turn away from tradition, try out this stunning pink-gold full-length sequin dress. This beautiful bateau neckline attire has a v-detail spaghetti strap and an open back that is sure to make your bridesmaids sparkle. 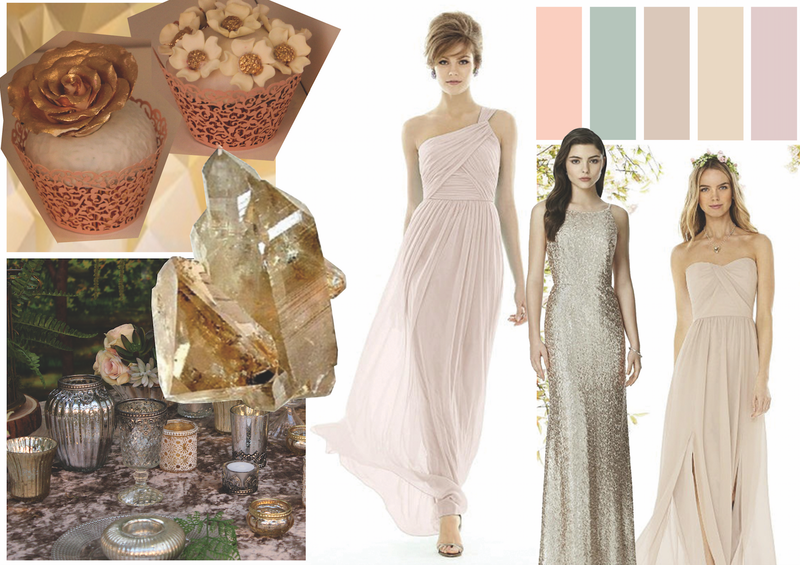 Why not have your bridesmaids in a mixture of gold, ivory, silver and pink-gold, instead of supporting a single colour? 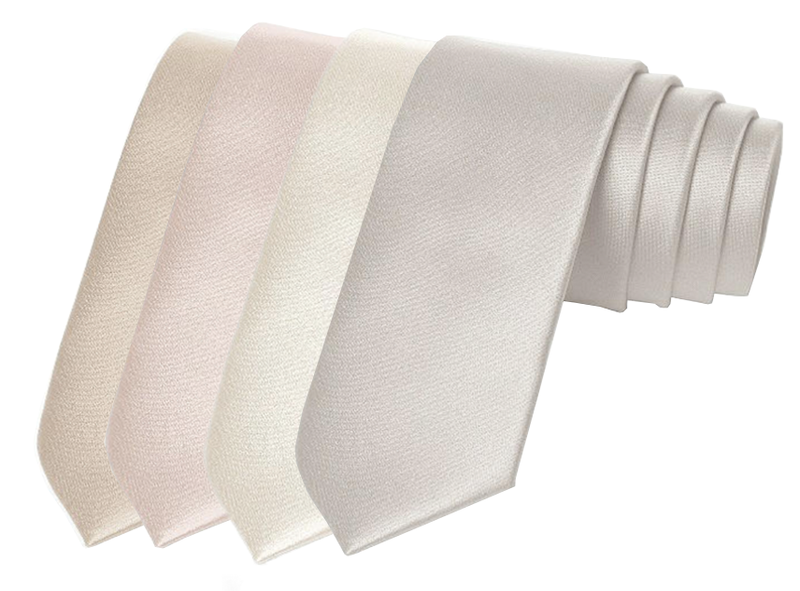 If you’re worried about matching the groom and groomsmen, Dessy has created a collection of ties that will go hand-in-hand with the bride and bridesmaids. At Just-A-Day we’ve got some new pieces coming in and one of them is the Tansy by Donna Solado. This dress comes in blush, which is a very light, pastel shade of pink which will work beautifully with brighter pastel colours such as those on the colour palette above. This off-the-shoulder, a-line style gown showcases the shoulders and highlights your narrowest point. The sequin, rhinestone belt separates the skirt that flares out gradually in the shape of an A, a silhouette that is flattering to any bride. 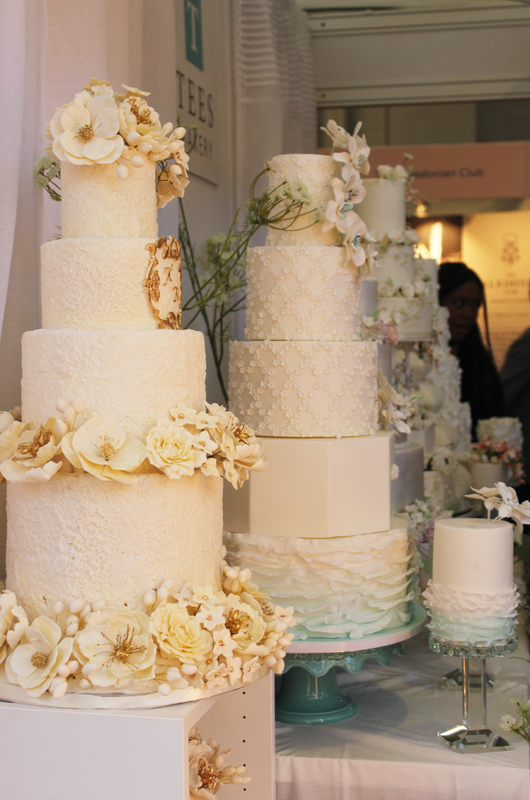 To top it off, this colour scheme produces exquisite wedding cakes. Below is an example of how this colour palette can be applied to guest favours and your wedding cake. Award-winning Tee’s Bakery has used a combination of ivory and gold, pastel pinks, blues and pink-gold. Whatever you go for, it will work perfectly with the dresses above. Let us know what you think!